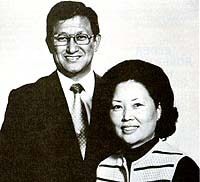 “Even now, we’re still kind of dazed,” is how Elder Adney Yoshio Komatsu (pronounced Koh-MAWT-sue) and his wife, Judy, described their feelings after Elder Komatsu was sustained and set apart as an Assistant to the Council of the Twelve. Honoring the confidentiality of the calling, they waited until Friday night to call their children﻿—sons Jay (23) and Grant (21) in San Francisco, and daughters Jan (19) and Jill (18) at home in Honolulu. “They were speechless too,” said Sister Komatsu. He was 27 years old then. Eleven years later, President Hugh B. Brown interviewed him and asked him if he would serve as bishop. “Will your wife sustain you?” President Brown asked, knowing that Brother Komatsu would have no time to talk to her before the meeting. “You don’t have to worry about that,” Brother Komatsu assured him. At the time of his call, Brother Komatsu was the first bishop of Japanese descent in the Church. Since then he has served as president of the Northern Far East Mission, the first time a man of Oriental descent had been called as mission president. He would again be first from his national background to serve as a Regional Representative and to become a General Authority.